Just Romantic Suspense: Hello, Hello! Congratulations to email entrant, "Sandra G." the winner of Rionna's giveaway. Thank you to all who participated. Lovely friends and fellow book lovers! I am so excited to be back visiting with you. Today’s post is going to be a bit different. Since it is so close to Halloween, I’d like to share one of my most favored stories. I’m an Army Brat; I’ve lived all over. I’ve had many, many spooky and thrilling experiences. One of the places I lived was in Alamosa, Colorado. I went to high school there and graduated from Adams State College. That small town is nestled in the arms of a high mountain valley. Surrounding it are the mountains of the Sangre de Cristo Range, the Blood of Christ. In this mountain valley there are many strange happenings. So strange in fact that there are books written about the mysteries of the locale. Christopher O’Brien wrote several titles on such incidents. My incident, however, to the best of my knowledge, has never been written. It is said that on the dark and stormy nights, when the winds race from the high peaks where the blood of Christ drips; when the hours of twilight have passed, when the all the travelers have deserted the winding turns of the River Road. It is then they say that she walks. No one knows where she came from. There are ideas of course. Perhaps she was on her way to the Homecoming dance or just coming back from the movies with her friends. Either way she is dressed like anyone, everyone. And she is walking along the side of the road. In the drifting beams of your headlights, you see her. She is alone and the night has become cold and the snow has stared to fall. You pull up beside her, wanting to help. She sees you and comes over. You roll down your passenger window; the light from your car illuminates her face. She smiles and says, “No thank you.” When you ask if she’d like a ride to town. Her hair is long and drifts in waves from her shoulders. Her smile is warm and sweet. You shrug your shoulders and drive on. Knowing you’ll see her again. But if for reason you’re too busy or are in too much of a hurry to stop and ask. Or if the terror in your blood is too strong this night and you drive by her, without stopping to help. By the next mile marker, she’ll be sitting in your passenger seat. Her beautiful face contorted with rage and pain. Her face wet with streaming tears of blood. And you’ll know that your life is over, because you left her there on the side of the road. Alone. 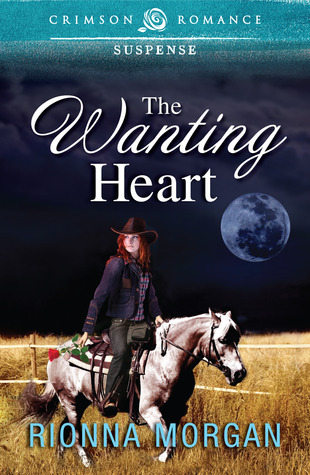 For dropping by today, I’d like to give one lucky commenter a free e-book copy of The Wanting Heart. In it a barrel racer gets swept off her feet by a serial killer. 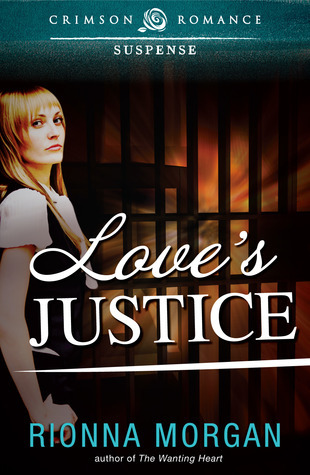 I wanted to let you know that I’ll be back in November to share my new release, Love’s Justice. In it two investigators uncover a decades old murder at an Alabama women’s prison. The book will be released November 12, 2012 from Crimson Romance. I can’t wait to share that story with you too! And, I’d love to hear a spooky story of yours! Please share!! Growing up out West, Rionna Morgan followed her love of horses to the rodeo arena and her love of English to the classroom and to writing. She has been looking forward to sharing her stories with you her whole life. Rionna is a founding member of Montana Romance Writers; she reads as much as she can possibly hold, and she loves most of all combining the chilling edge of a knife with the sweet surrender of romance. Rionna shares her home in Missoula, Montana with her husband, her four children and the mountains outside her window. Please be invited to stop by rionnamorgan.com--she loves the company. Book Blurb for Love’s Justice Coming November 12th! Sarah Johnson is a profiler in Portland, Oregon. She thinks she has successfully moved beyond the pain of her mother’s death 15 years ago. Her mother, a Pulitzer Prize winning writer, died in an Alabama women’s prison while on an undercover assignment. However, when Justin Breslow shows up at her office claiming to be an investigative reporter from Dallas wanting to do a feature on her mother, Sarah realizes the pain has just been dormant. She agrees to work with Justin; she’s always wanted to retrace her mother’s final days, but she has no intention of sharing family secrets with a perfect stranger. Sarah and Justin unravel a plot more complex and sinister than they expected. They pursue a trail of deceit and corruption to a women’s prison in Alabama, a centuries old hotel in Georgia and a family ranch in Texas. Nothing is simple or as it seems. Along the way, Sarah tries not to fall for Justin’s Southern charm, and Justin fights to resist Sarah’s beauty and sharp intellect. This unlikely duo will find more than they ever hoped to—in the prison, in their own backyards, and in each other’s arms. Whether they survive to enjoy their discoveries is the final mystery. Please be invited to visit my blog to Enter to Win a Piece of Montana! What a great story. I can so easily imagine one of my kids doing that very thing. Thank you for stopping in and sharing! May romance and a bit of mystery grace your day! Wow, what a story! Thanks for sharing and congrats on your upcoming release! Happy Halloween! Thank you for the very nice compliment and the congratulations! So wonderful to know you. What a great ghost story ! Your books sound very good and I look forward to reading them. Keep up the writing! So wonderful to meet you! Thank you very much for the compliments. I hope to always entertain. My parents' house is haunted. Voices are heard during the nights while everyone is sleeping. My sister and I would hear a dog walking in the house against the hardwooden floor and we don't have a dog. Sometimes, things in the house are moved from one place to another and my sister and I knew that we didn't put it there. Of course, my parents would said we dreamed these things up but they can't justified an explanation when my sister and I are wide awake. Great and spooky!! Wonderful. I love stories like that. It helps reaffirm that we aren't alone in this universe. :) Thank you so much for dropping by. It has been so wonderful chatting with you! Three friends and I were playing dice and card games after getting our young children down for the night. We hadn't been playing long when I saw one friend's 3 year old daughter peeking at us over the side of the couch. I let my friend know her daughter was up. We finished the card hand and she went to check on her. She came back saying her daughter was sound asleep. I thought it was funny that a 3 year old could be so convincing since I had seen her not 5 minutes before. It was another 10 minutes or so and I saw the daughter again. This time I didn't say anything, just pointed. My 3 friends looked at me like I was crazy. I told everyone the daughter was back out and laughing at us. They looked to where I was pointing ...back at me and told me no one was there. I was flabbergasted as I could see the young girl, why couldn't they? My friend asked me what she was wearing. I told her pink footie pajamas with Winnie the Pooh on them. She started crying. I was getting really nervous and that they kept insisting they couldn't see her was getting old. Now the girl's mother was crying? The little girl kept mouthing something and I could make out "mommy". The mom finally said that it was her deceased daughter, killed in a car wreck at the age of 3 before I met her. I had even described what she had been buried in. Now my friend is asking me to tell her "Mommy loves her." I'm panicking because none of them think its weird and I told her to tell the daughter...I was leaving. The little girl frowned at me and mouthed "No!". Damn...I sat back down. The mother told me to ask her if she was alright. I did so and the response was a shake of the head indicating No she wasn't alright. I was then directed to ask her if Mommy needed to visit the grave site. This time the head shake indicated yes. The mom asked me to tell her that we would be there in the morning but when I turned back the little girl was gone. The next day we went to the grave site... all the beanie babies and stuffed animals around her head stone had been stolen and the stoned knocked over. I don't know why I was chosen to see her, but I was glad we were able to figure out what she needed. Probably the most mind-boggling (to me) part was that my 3 friends acted like it was normal while I was freaking out! Anyway....thanks for stopping in again and telling us about your upcoming release and the giveaway! Oh my goodness, you made me cry. What a touching, frightening story!! Thank you for sharing!! You are very welcome for stopping in. I so enjoy this wonderful blog! Everyone is so great all the time!! Congrats on the book! No spooky stories to share. Thank you for the congratulations! It's very nice to meet you! I hope I got my name in time. I would really like to read this one! I hope you did too! And I would be honored for you to read it! !